March 9th, 2019 - Does My Bomb Look Big In This? 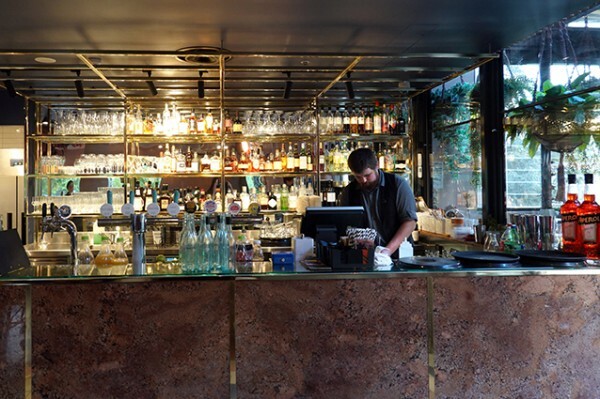 At the far end of Agostinis there are two coveted leopard print booths. 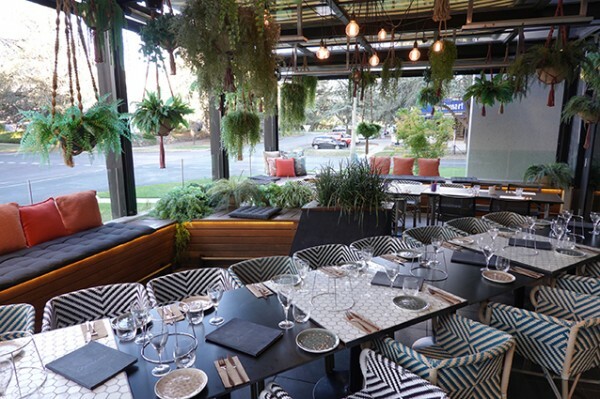 Their commanding position sees the whole restaurant – bar for the leafy green outdoor area – stretch out in front of you. The 120-seater restaurant is huge, yet somehow the booths' comfortable padded curves envelop your group and create a sense of intimacy. 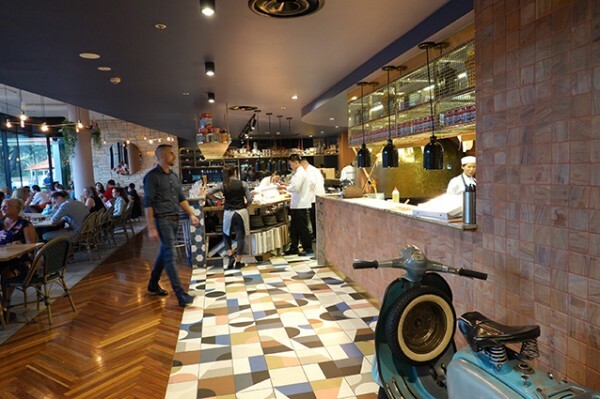 In a savvy move to avoid diner seating disputes, the booths are now both designated as La Tavola di Francesco – chefs tables. 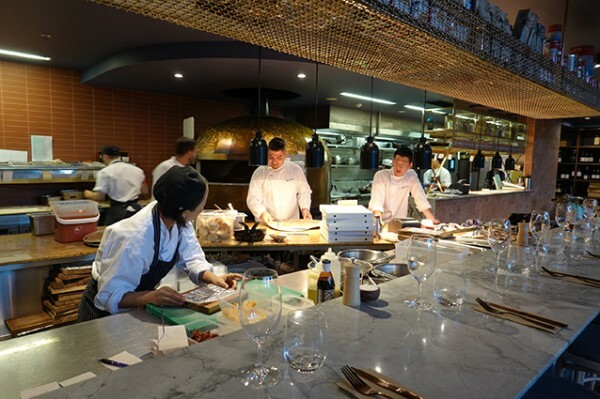 To dine at them you need leave your fate in the hands of Chef Francesco Balestrieri; giving yourself over to a bespoke Italian Dining Experience ($85/head) for two to four people. After parading the length of the two-year-old restaurant, taking in the gleaming, state-of-the-art Marana Forni rotary pizza oven, we’re quickly made comfortable with an aperitivo. 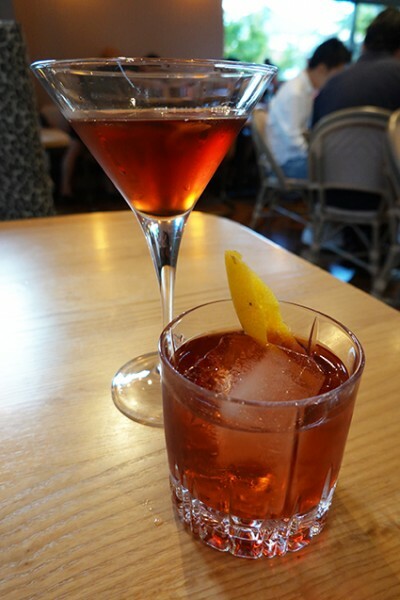 For me that’s the standard Negroni ($18), while my dining companion gets settled in with a rye whiskey version of the same drink - the Old Pal ($18). Embracing the hands-off approach to dinner, we opt to leave Matched Wines ($55/head) in the talented hands of Food and Beverage Operations Manager, Danilo Acioli. 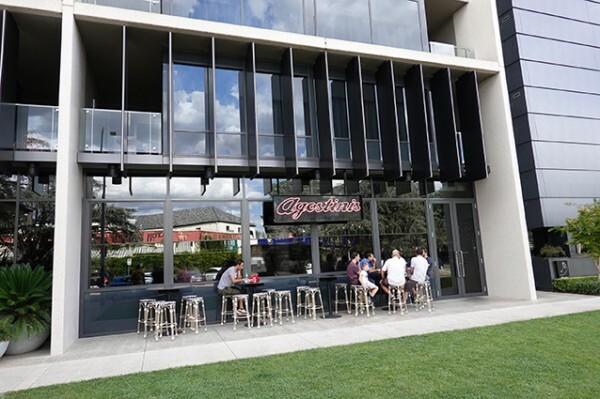 Acioli, who last spent time with renowned Sydney restaurant fixer, Danny Russo at The Russolini Group, was also a hands-on director at popular Drummoyne eatery, Copo Café & Diner. 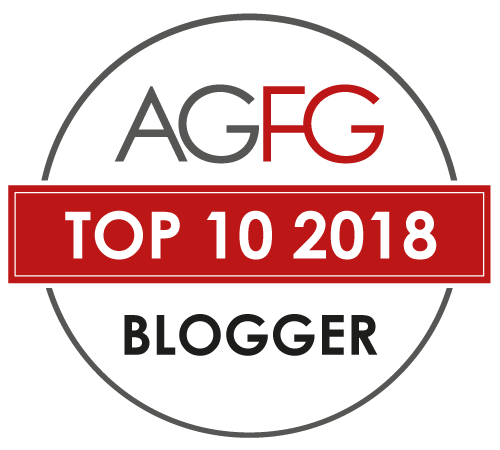 Acioli’s nuanced service shows in the way he ascertains our dietary requirements without giving away the whole menu, and in his wide-ranging discussions about Canberra district wine and produce at the table. 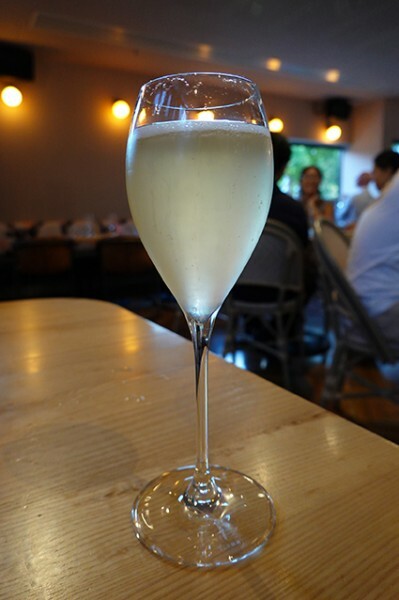 We kick off with the NV Dal Zotto Prosecco ($12/glass), that Acioli rolls at the table to evenly distribute the yeast in the bottle. 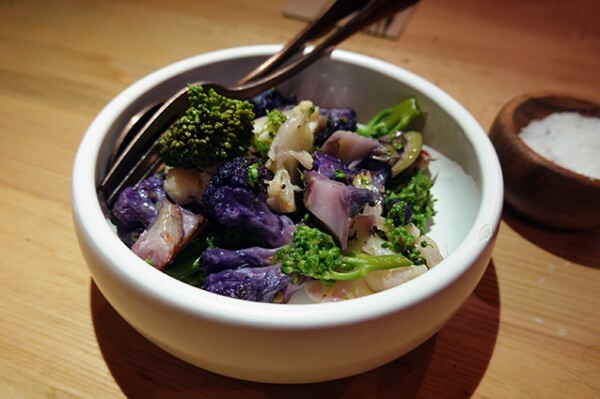 It’s lightly cloudy as a result, and drinks dry like a cider against Zucchine e Burrata ($20). 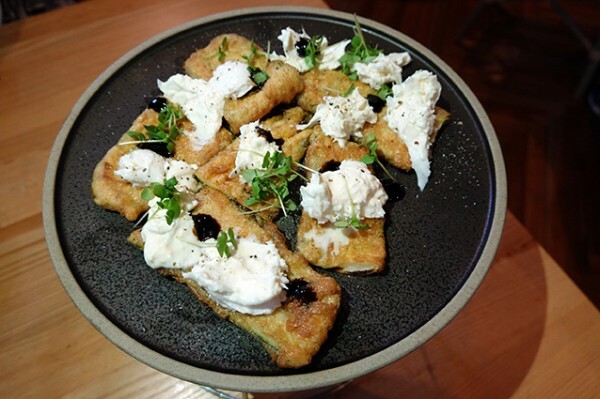 Arriving almost immediately from the busy kitchen, the lightly fried zucchini ribbons are topped with dabs of balsamic glaze, and creamy That’s Amore burrata, made on local milk a few kilometers away in Fyshwick. The dish is under-seasoned, but with salt on the table, and a hotel restaurant brief to cater for all comers, I suspect it’s deliberate. 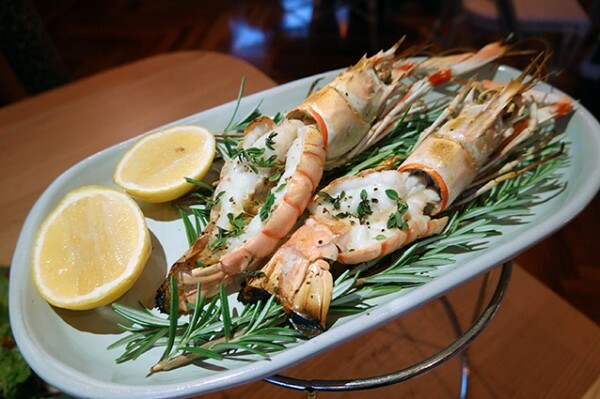 Whole scampi arrive next in an aromatic cloud of rosemary. Balestrieri has cleverly pulled them out of the pizza oven before they’re finished, and the creamy lemon-infused crustaceans have completed their cooking on the way to the table. 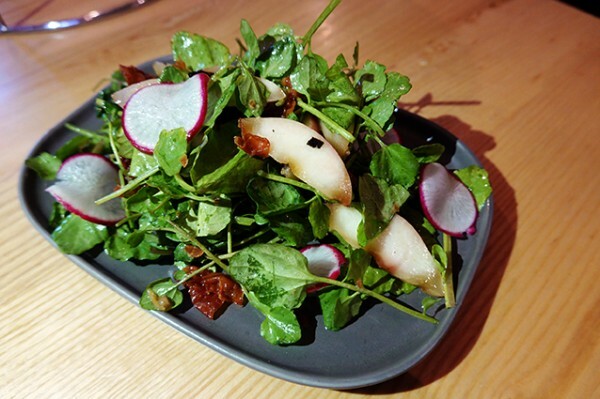 They’re served with a lovely watercress and peach salad set off by crisp prosciutto. Neither of these dishes are on the regular Agostinis menu, making us feel a bit special over here in our leopard-print seats. 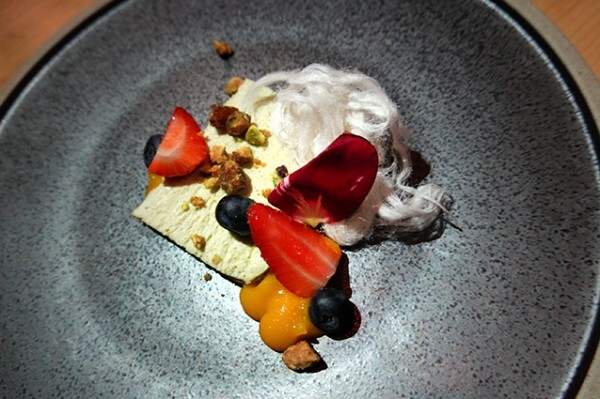 That feeling is compounded when Chef Francesco Balestrieri delivers the next course himself. 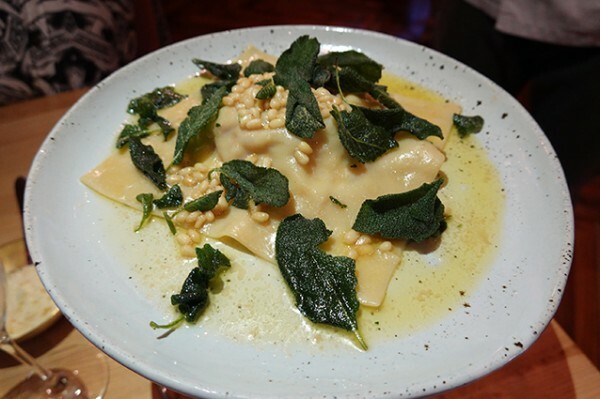 Inspired by a recipe from his own Nonna, Balestrieri carves his delicate buffalo ricotta and prosciutto raviolo into two pieces, serving one half to each of us. 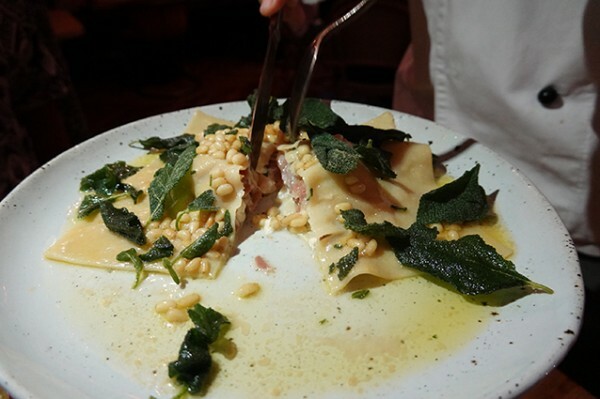 The silky sheets of pasta have been made as thin and light as possible to allow you to taste the high-quality filling, but somehow, they also retain good bite. 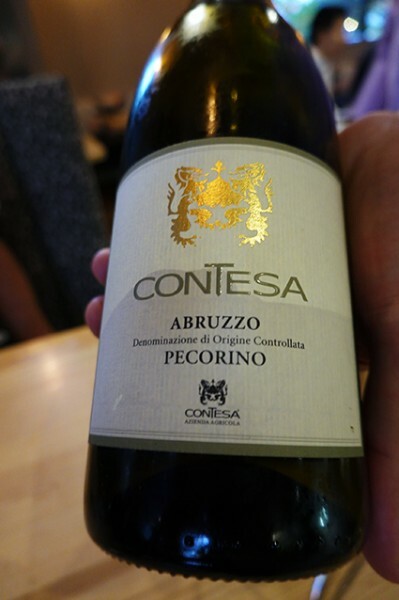 Burnt butter, pine nuts and crisp sage leaves add some decadence to this beautifully balanced pasta, their wickedness cleverly offset by the 2017 Contesa Pecorino d’Abruzzo DOC ($14/glass). It edges out the scampi to be my dish of the night. After taking the opportunity to grill the chef about his pizza oven, which through rotation can cook up to twelve pizzas in four minutes, I’m pleased to see some focaccia land so I can taste his 72-hour proofed dough. 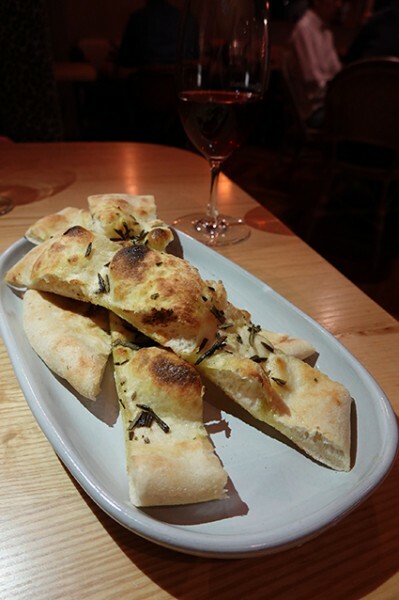 While the chefs table menu sensibly doesn’t include stomach-filling pizza, the pliable, tasty bread is enough to make me want to come back and give his wood fire-started, gas-modulated, Roman-style pizzas a go. I’m soon distracted from wanting pizza with more lamb cacciatore than I can consume. 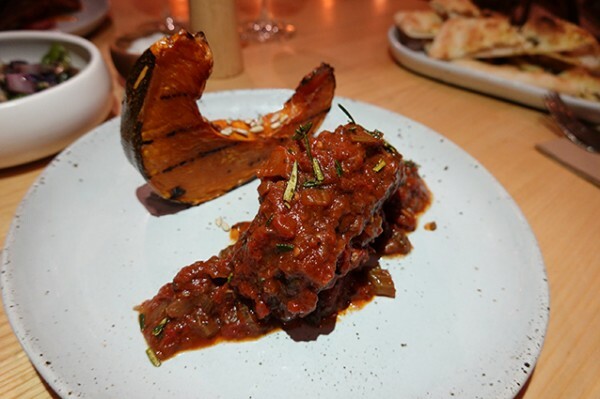 The lamb is achingly tender – able to be nudged off the shoulder blade with a gentle tap from your fork. The rich tomato and red wine-based sauce is cleverly balanced by a sweet wedge of pumpkin cooked in the pizza oven until its very skin is caramelised and delicious. 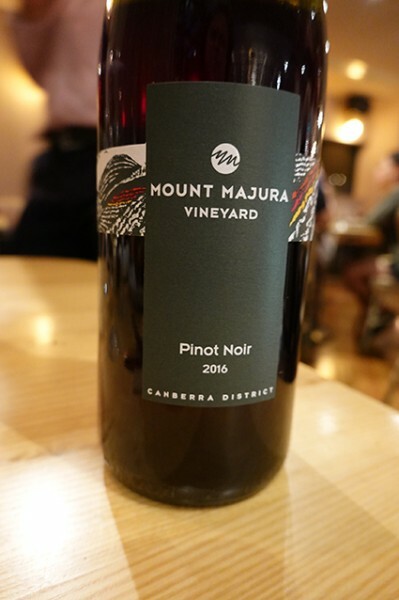 The 2016 Mount Majura Pinot Noir ($15/glass) is a nice accessible match, and with Acioli’s encouragement, we resolve to visit the cellar door the next day to try their famous Tempranillo. Easing back into the booth’s embrace, I despair fitting in dessert until a delicate portion of pistachio semifreddo arrives. It eats like the waning summer with ripe mango gel and the last of our summer berries, with freshly roasted nuts giving you a hint of the winter pleasures soon to arrive. 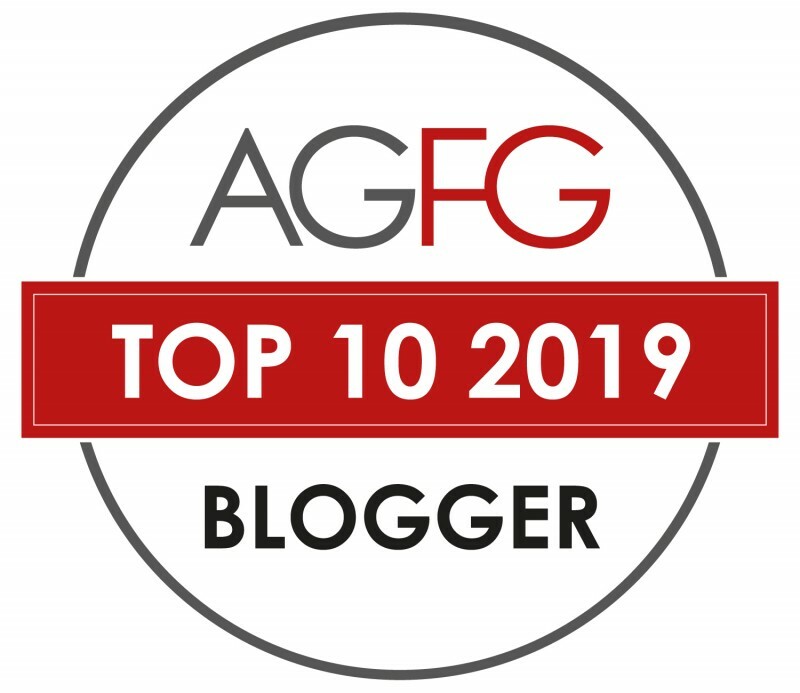 As I sit back sipping Mount Majura Noble Pinot Gris ($10/glass) contemplating making the short journey to my suite upstairs in the East Hotel, I feel replete. It's more than just food, there’s a lot of heart in this simple chef’s table affair. 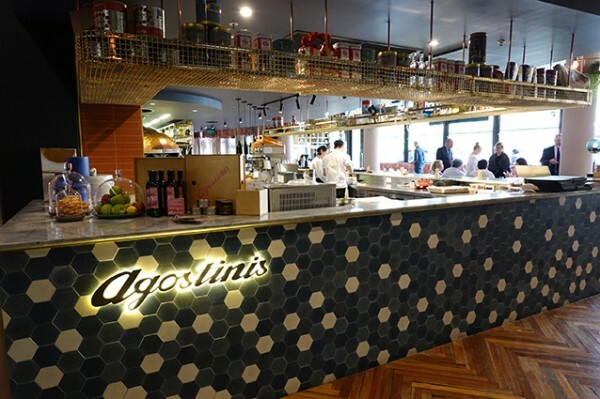 The Agostinis team give a lot of themselves over the course of the evening, letting you understand what motivates them as they deliver you your easy-to-like, Italian family meal. That’s no mean feat in a restaurant also doing 200 sit down diners plus 80 takeaway orders on the evening I dined, with many large groups (happy birthday rang out four times between 6pm and 9pm). 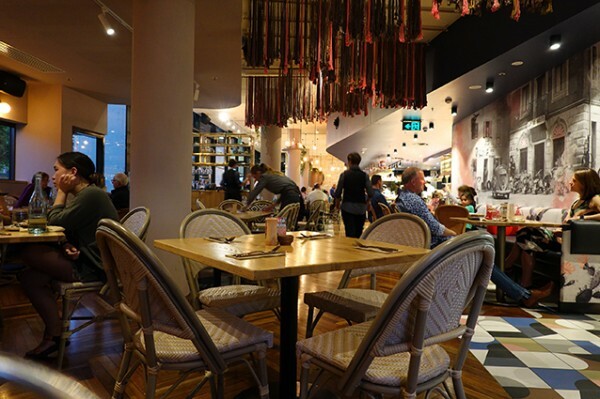 Agostinis is clearly where Canberra comes to celebrate, and after my evening, I could certainly see why. NOTE: Read about the East Hotel HERE.